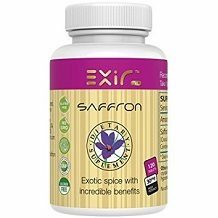 Welcome to our review today of Exir Saffron Dietary Supplements. The product pacifies the cardiovascular system and improves brain chemistry. The product also improves vision. Saffron has been extolled for developing a healthy blood pressure and increasing the blood flow and oxygen to the brain. It promotes physical, emotional and mental health. The product consists of saffron, saffron extract, vitamins, minerals, antioxidant carotenoids. This product does not contain any artificial colorings or preservatives and is gluten-free. It is also suitable for vegans. The supplement is made in America. The product consists of 120 tablets in the container. One tablet should be consumed 2 to 3 times a day. The manufacturer does not mention if the tablets should be taken prior to meals or after. Also, the time of the day for the consumption of the tablets is not stated. The manufacturer has not reported any side effects for the product. Experts have claimed that the formula the product contains does not have any side effects, but consuming Saffron may result in side effects such as a headache, dizziness and anxiety. One customer reported that the product had a very unpleasant smell. The number of reviews by customers on the internet is very limited. To purchase Saffron’s container of 120 tablets from the manufacturer’s website, it will cost you $39 with free shipping, which will take 1-2 days. The product has been slashed from its original price of $45. Saffron is listed on Amazon for $40 with an additional $2.35 for shipping and handling fees. The manufacturer has not offered any guarantee with the product nor is a free trial made available to customers. This is not a good sign of the confidence of the manufacturer. 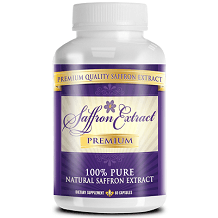 The Saffron Dietary Supplement promotes cardiovascular health, increases brain function, reduces stress and helps to improve blood circulation in the digestive system. Saffron, also, improves eye health by enhancing the circulation of the retina and also assists in the healthy production of cell energy. However, the dosage found in this product is much lower than in some other products out there. The product also contains a long list of inactive ingredients. The manufacturer states that this product does not cause any side effects, however, consumers of Saffron have reported that they suffered from headaches, dizziness, and anxiety after consumption. The manufacturer does not provide any money-back guarantee for the product nor does the manufacturer offer a free trial period. The product is quite costly compared to similar products on the market. Certain dosage information such as consumption of food in correlation to the intake of the product is not mentioned and the time of the day for the dosage is not stipulated. Customer reviews available on the net are very limited which may indicate this is a not a well-used product.